The context is different in Des Moines. 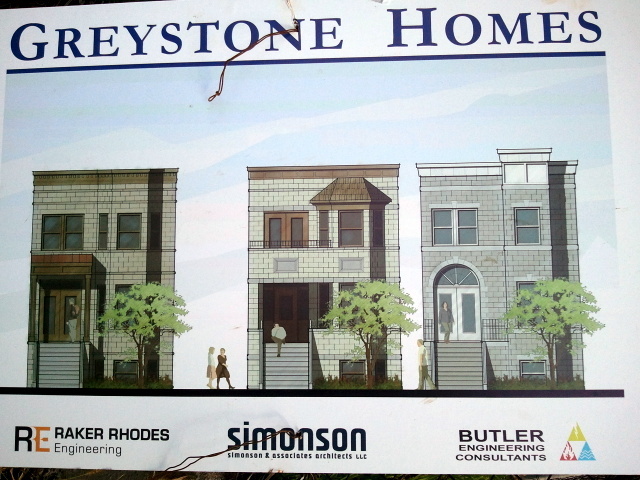 Best case for the Des Moines Greystones development, it would have been nice to see a contemporary reinterpretation of the styles that form the context in the surrounding neighborhoods. We will follow this development as construction continues. Last night I had the honor of being asked to speak at the Ames Historic Preservation Commission meeting. Spurred in part by the Ames School Board's proposal to demolish Roosevelt Elementary, the Ames Smart Growth Alliance and the Ames Historic Preservation Commission are planning a preservation education series (full disclosure - I hope to be one of the speakers). The Ames Historic Preservation Commission is set up similarly to the counterpart here in Des Moines. Exterior rehabilitation and construction projects in the local historic districts must first receive a "Certificate of Appropriateness" from the HPC. The HPC interprets the enabling ordinance and local district guidelines, with the assistance of City staff, in order to determine whether or not proposed projects comply. On the evening I attended, there was but one project on the docket for approval: a new trellis over an existing back deck. The trellis is well-considered and ties in to the homes historic detailing. It sailed through with little discussion. Interestingly, one of the citizens who came to speak in favor of preserving Roosevelt Elementary was my high school art teacher... Small world. I arrived in Ames about a half hour early and took the opportunity to revisit Main Street. There have been substantial streetscape improvements since I left Ames in 1993... I couldn't help but compare them to the more recent Ingersoll work. Ames Main Street clearly demonstrates why "main street" as a concept is so important to preserve: moderately dense (for midwest standards) mixed-use development that prioritizes pedestrians and integrates into the surrounding residential areas is a sustainable model for supporting small, local business. What I particularly like about the Ames approach is its simplicity. Angled parking creates a comfortable buffer for pedestrians. Wide sidewalks allow for a comfortable path of travel for pedestrians. Bike racks encourage alternate transportation. Canopies and overhangs provide protection from the weather. A view of the continuous storefront retail is not obstructed from the street. Cars do not cross the pedestrian path of travel. Cars and pedestrians don't play nice. It is best to keep curb cuts across public sidewalks to a mininum in pedestrian-oriented development. Let's take a quick look at the differences between Ingersoll and Ames Main Street. Ingersoll has been the focus of a huge streetscape improvement project. Things I really like are the bike lanes, contemporary streetlights, and the street trees. However, these are balanced by a several "deal killers" in my book. First and foremost, there are no mixed-use buildings. A viable and successful "main street" must have residents as an integral part of the mix. Residents provide a ready-made clientele for the businesses and activate the street at times when the businesses are not open. Second, the planters are just overkill. Aside from taking a lot of time, energy, and money to maintain, they block drivers' view of the storefront retail. They also make the parking less accessible. A passenger with a mobility impairment would have difficulty navigating the thin sidewalk between the curb and the planters. Third (a corollary of the previous), the sidewalks are too narrow. 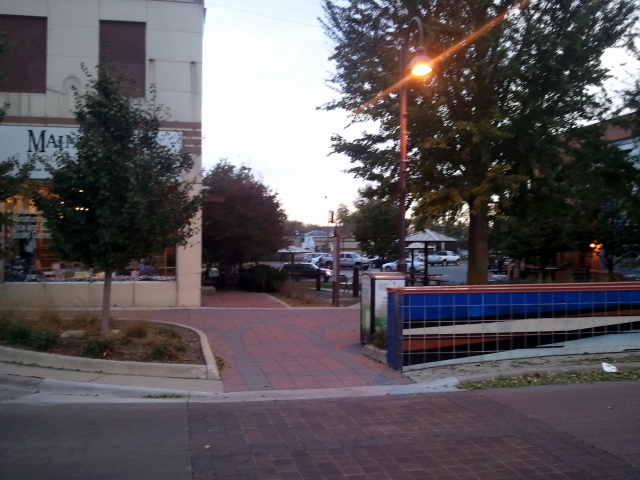 Most of the space between the businesses and the street is taken up with planter. But plants can't shop at stores or eat at restaurants... If you want a pedestrian-oriented retail district to thrive, this space should be primarily designed for people. That last one is a big one, too. Why? Because pedestrians expect to have right of way on a sidewalk and people cars don't like to give up the right of way anywhere. Cars crossing designated pedestrian paths of travel is a surefire way to promote someone getting hit. Conversely, along the Ames Main Street, parking behind the buildings is accessed by car only from perpendicular side streets. After parking, pedestrians can filter through to the sidewalk in front of the buildings through regular gangways and pocket parks (illustrated below). They can also enter directly into many of the stores through back doors. 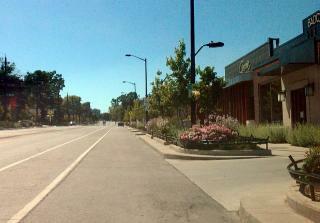 Is there a long term plan for Ingersoll as a pedestrian-oriented retail district? If so, there needs to be a comprehensive plan to reduce curb cuts. And finally, I ran across this picture in my phone. 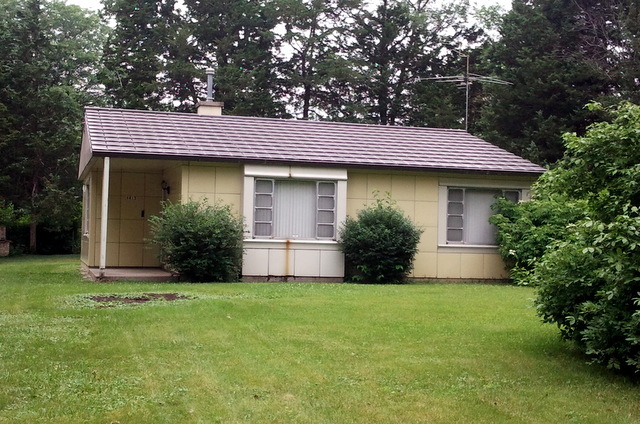 I collect photos of Lustron homes that I pass by... I'm not sure why the Lustron story is so compelling to me. Certainly, it's not because I'm particularly in love with the houses themselves. I think the idea of an all-steel house is not particularly good: it's a terrible insulator, it rusts, it conducts electricity, and prefab homes themselves are the opposite of the craft that draws me to historic preservation. Yet, I am fascinated with the story of Carl Strandlund, a man who set out to fundamentally change the way we produce housing for our citizens. I'm glad he didn't succeed but I also want to preserve the story of his idea, kept alive in the unaltered architecture of the little steel anachronisms that dot our urban and suburban landscapes... That they are unique today is a bit ironic because Strandlund's intent was that they become ubiquitous. I'm glad that people continue to buy and maintain them so we can continue to appreciate them. I'm holding my official reaction to the greystones until they are finished, but I, too, have reservations concerning placement. I applaud efforts to increase density and urban housing options in Des Moines. But I would have preferred that these sites not be scattered throughout various neighborhoods and, instead, find ways to gain a critical mass of these on one or two blocks so that could be expanded over time, and eventually this type of development could become a distinct housing context of its own. I am excited that Hatch Development is willing to try new, interesting, and higher quality affordable housing options in Des Moines! 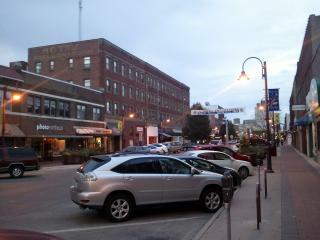 Comparing Ingersoll to Main Street in Ames is ridiculous! Grasping at straws. Thanks for reading - I appreciate feedback, but you will have to be more specific. I'm interested in your thoughts... What about the comparison is ridiculous? What, in your opinion, would be a more appropriate comparison? Successful urban-ish pedestrian retail districts tend to have many elements in common. I think we pretty much know how to do it right in terms of overall form, mixed use, accessibility/connection, and location, (am I missing anything here?). So, I return to the question... clearly, the idea is to promote development of Ingersoll as a pedestrian retail district. If so, what should we be shooting for in your opinion? How can the City and business association best encourage such development and best target political capital and financial resources to make that happen?